Fun fact about me: I really really love fictional princesses, especially the Disney ones. Back in my younger (and hotter) teenage days, I was Jasmine for Halloween. Since getting into costuming and, even more recently, getting into Comic Cons, it has become very obvious that I need to do some Disney princess costuming, or my inner 10 year old will never be satisfied. I've always had a special place in my heart for Snow White, but Belle is the one I identify with most. And every fiber of my being has been crying out, since I was 11 years old, for a yellow ballgown of my own. 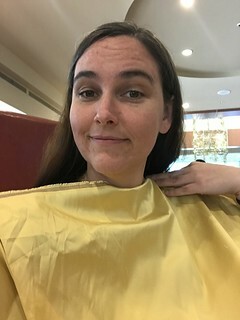 After believing for years that I couldn't wear yellow, I have finally found one that looks halfway decent with my coloring so I AM GETTING THE BELLE DRESS OF MY DREAMS! Acquire a new hoop kit. I'm trying to work up the courage to call and order the Wooded Hamlet cage crinoline kit. Acquire a new corset. The current plan is to throw money at the problem and order a custom one from Redthreaded. I might end up making one, because I have all the supplies, but I REALLY don't want to. I'm thinking that I will take the basic idea of Belle's yellow gown (off the shoulder, round skirt, swags at the bottom) and mix it in with actual historical trimmings and subtle rose themes. It looks gorgeous in my head. There you have it! Not only will this dress be big, but I have big plans! I'm hoping to have it done by November so I can wear it to a ball in Gettysburg, but like all my plans, we'll just have to wait and see.